When it comes to diagnostic tools, there are so many on the market that its hard to choose between them. There are a few things to bear in mind before purchasing a tool, So lets take a look. We will start off with the flagship of diagnostic equipment, the AUTOLOGIC ASSISTPLUS . This is the professionals choice of tool for european vehicles. With technology pushing the boundaries everyday, this tool can keep up with the pace. The autologic can take care of pretty much anything you throw at it, and completing various tasks where other fail. For a busy diagnostic/chip tuning workshop, this is the 1st tool of choice. Cheap ebay tools starting at around £10 will not cut it. At best, the only data they will recover are OBD compliant codes. All they can do is a basic read of the error memory. They may show some live data. The seller states that they can do much more, but for £10 what do you expect. Carrying out checks in engine management for logged DTCs prior to calibration is where basic eobd code readers fail, they can only read generic codes that all manufacturers must use to relate to emissions related failures. Basic eobd code readers cannot usually read manufacturer specific codes. This is where a good scantool is required. Mid range tools like the Autel maxidas, Snap-On Solus range and Delphi DS150e. These are the minimum requirement for chip-tuning and diagnostics. They can read both generic and manufacturer specific DTCs. They can display live PID data and carry out some resets and adaptions. Generally a good base level tool with some functionality. High level Tools such as Snap-On Verus pro, Bosch KTS range, Autel Maxisys have a wider range of applications and more functionality. These are a good choice for chip-tuning as they cover the majority of areas required. Full live data display, DTC read with good descriptor, the ability the clear faults fully from all memories and carry out adaptions/Resets as when required. What is a Diagnostic Trouble Code (DTCs)? Diagnostic trouble codes (or fault codes) are codes that are stored by the on-board computer diagnostic system. These are stored in response to a problem found in the car by the system. These codes are stored, for example, when a sensor in the car reports a reading that is outside a pre-defined range, e.g. fuel mixture too rich. The codes identify a particular problem area and are intended to provide the technician with a guide as to where a fault might be occurring within a car. circuits or components should be tested to fully diagnose the fault. Parts or components should not be replaced with reference to only a DTC. The vehicle service manual should be consulted for more information on possible causes of the fault, along with required testing. For example, if a DTC reports a sensor fault, replacement of the sensor is unlikely to resolve the underlying problem. The fault is most likely to be caused by the systems that the sensor is monitoring, but might even be caused by the wiring to the sensor itself. DTCs may also be triggered by faults earlier down the line. For example, a dirty MAF sensor might be causing the car to overcompensate in its fuel-trim adjustments. As a result, oxygen sensors are likely to report fuel mixture problems. by the on-board computer (ECM or PCM). Generic code P0xxx - The definition for the code is defined in the EOBD / OBD-II standard and will be the same for all manufacturers. Manufacturer-specific P1xxx - These codes do not fall under european standards, so this enables manufacturers to define these codes themselves. The fourth and fifth characters identify the section of the system causing the fault. There is no detailed list of the components indicated by these digits, as each system or sub-system will have many different components. What is CAN (Controller Area Network)? Controller Area Network (or CAN) is the latest communication system within the automotive world. At its simplest level, it can be thought of as a means of linking all of the electronic systems within a car together to allow them to communicate with each other. As computerisation within a car increases, so to does the number of different electronic systems. The information recorded and processed by each one is often used by one or more others - hence the requirement for a standardised means of quickly passing information between them. This requirement led to the development of CAN. The CAN technology was first developed by Bosch for industrial use, but was quickly recognised as a powerful system for in-car use. Some manufacturers were actually using the technology within their cars from as early as 1992, e.g. Mercedes. Which cars use the CAN protocol for diagnostics? 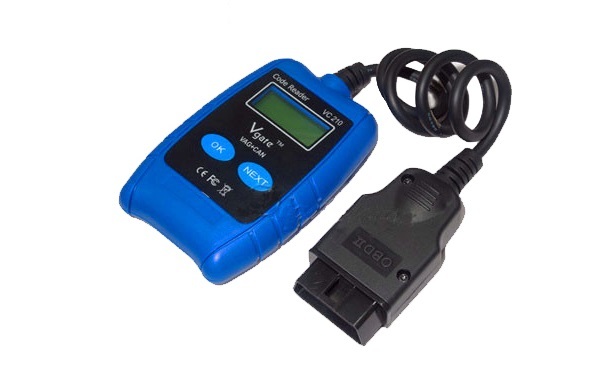 Within the car diagnostics world, on certain 2003 and newer cars, it is possible to access the CAN network (and communicate with various onboard systems) through the 16-pin OBDII/EOBD diagnostics port. Prior to 2003, manufacturers were required to provide non-CAN interfaces under the OBDII/EOBD legislation, e.g. PWM, ISO etc. Many of these newer cars, e.g. Ford's latest range, Mazda RX-8, the latest Vauxhall Vectra, offer only the CAN protocol/interface as a means of communicating with the engine-management system. This will actually be mandatory on all cars by 2008. Whilst many of these cars might still be under the manufacturer warranty, anyone investing in diagnostic tools for the long term should ensure that their tools support the CAN protocol. The CAN protocol now forms part of the OBDII and EOBD standards. Manufacturers could begin implementing CAN for engine/emissions diagnostic purposes in 2003 and must implement it by 2008. What are the benefits of CAN-based diagnostics? The CAN protocols and interface run at roughly fifty times the speed of the earlier OBDII/EOBD protocols. This speed improvement, combined with the addition of new diagnostic parameters, will give technicians the ability to see data faster and gain more information from newer cars than is currently available. The original OBDII/EOBD protocols (J1850-PWM, J1850-VPW, ISO-9141 and ISO-14230) did help reduce the number of tools required for engine/emissions fault diagnosis, but by allowing 4 protocols there was still a great deal of confusion, and over-complexity of tools. Simplifying this to a single protocol can only lead to reduce this confusion, and the cost of diagnostic tools. Which diagnostic port pins are required for CAN? The car will also need to have pins 4 and 5 (ground pins) and pin 16 (12 Volt supply). Which cars currently support CAN? Most new models from all manufacturers from approx. 2004 - CAN must be used for EOBD engine diagnostics by all manufacturers by 2008. For our American users this subject maybe something that you are already familiar with. SAE J2534 is a standard for communications between a computer and a vehicle. Government regulations require all automakers provide a J2534 service to EVERYONE in the U.S. for re-flashing emissions related controllers. If you own a SAE J2534 Pass-Thru device, you can re-flash and, in some cases, diagnose vehicles with factory functionality. What can J2534 do for me? ECU re-flashing aside, Some OE Manufactures offer dealer level support and dignostics without the requirement for expensive Dealer level or tooling. *A well spec'd J2534 pass-thru interface with a comprehensive level of communication protocols, will be compatible with most OEM's. Below is a list of current manufacturers that offer independent shops dealer level support. As an example from the list above, BMW allows full diagnostic and re-flash capabilities from their website. Some particular vehicles require a 20-pin BMW diagnostic connector. Most BMW’s after 2000 are OBDII vehicles. All BMW’s with the OBD connector require a 7-8 pin adapter to be used with pass-thru diagnostics and re-flashing. Pass-Thru is available on MINI vehicles 2002 and newer. With Web KSD, you can view the number of flat rate units corresponding to each repair. Based on the vehicle identification number or by selecting the series and model, you can view the flat rate unit data for defined scopes of repair work for each BMW Group vehicle. You can call up information about approved wheel/tire combinations for models from E36 or later. 4. ISTA/P Online - Control Module Reprogramming With ISTA/P you can reprogram the onboard control modules that are capable of software reprogramming. For ISTA/P, a data interface, a power supply and an Internet connection are required. The data interface can be an ICOM or the "Pass-Thru Tool (PTT)" that fulfills the requirements of the SAE J2534 standard. The P code module allows you to search for standard SAE P codes and BMW-specific P codes, which you can read out from the engine control unit using a generic scan tool. The P code module is especially helpful for users who do not own BMW-specific diagnosis systems, but read out fault codes using a generic scan tool. The corresponding P code can be read out via the vehicle identification number. So as you can see from the above, a BMW independent specialist can offer full dealer level customer service. No longer having to send vehicles back to the main dealer for system updates, new control unit configuration or simple technical service bulletins. This page was last modified on 15 February 2016, at 23:13.